Doctoral Regalia including doctoral robes, caps (mortarboards and tams) and academic graduation hoods for faculty and students. IN STOCK and Custom Made! The look, feel and quality you would expect from a fully custom gown, but for hundreds of dollars less! 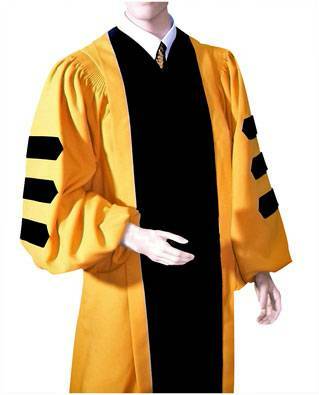 We believe this to be the finest off-the-rack doctoral gown available at any price. Gown is fully tailored with gathered sleeves and finished with a cord and button below the back yoke. In addition to the 4 IN STOCK versions of the deluxe gown, we can also special make your gown with other color fabrics, velvets or piping. For example shown below is an Ed.D. gown with black velvet and light blue piping, and a second Ed.D. gown with light blue velvet and gold piping. Custom gowns generally take about 6 - 8 weeks to make. 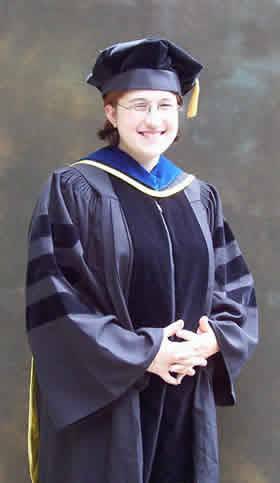 If you wish to order a customized gown but require it sooner than 6 weeks, we can usually send you a generic doctoral loaner gown (at no charge) while your custom gown is being made, so save you the expense of having to rent. Then when you receive your special made gown, just send the loaner one back to us. Please allow approximately +/- 8 weeks (depending on season) for delivery of customized (non-stock) deluxe gowns. If you would like us to customize your gown, but are in a rush, we may be able to send you a loaner gown for you to wear while your deluxe gown is being customized. 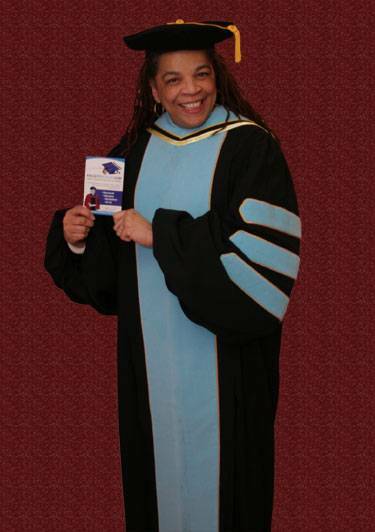 In addition to your doctoral gown, most peole will need to purchase a doctoral hood. 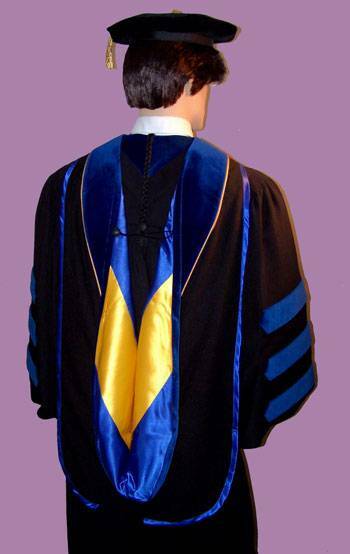 Deluxe doctoral and PhD hoods are available with or without piping. 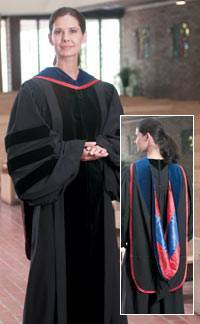 If your doctoral gown has piping, then you will probably wish to order matching piping for your hood. In the case of Ph.D. degrees, Royal blue is used regardless of specialty or field of study. but a Ph.D. in education would use the darker Royal Blue velvet. For most universities in the USA, the satin lining of your hood normally represents your school's colors. For many international universities, the satin colors may represent the school's colors or may indicate your degree or specialty. Together with the gown and hood, you will most likely need a hat. The most common types of academic hats are either velvet tams or mortarboards. Although not generally required, most faculty members who have doctoral degrees choose to purchase tams to differentiate themselves from students and non-doctors who normally wear mortarboards. If you do not wish to purchase a tam, then we will be happy to send you a mortarboard and tassel at no charge, upon request. Tams are available in choice of 4 sided; 6 sided; or 8 sided models, with choice of silky tassel or bullion tassel. Given a choice between purchasing a better quality gown or using the money for a tam, we normally recommend the better gown, reason being that the gown is a lifetime investment (you will be using it for your entire career) and while you can't upgrade a used plain gown for a fancy deluxe gown, you can always upgrade your mortarboard to a tam at a later date. Still at some point, most faculty members to end up purchasing the tams since they do look so much nicer than the boards. A superior quality, fully tailored gown, priced to own! The faculty gown is our no-frills gown designed to be economical yet unlike student-souvenir gowns, these gowns hold up over time, similar to a rental gown. The fabric is the same material as the deluxe gown, but the velvet is not as plush, and the sleeves are open style. 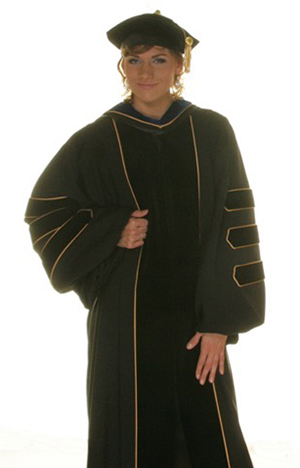 Faculty gowns are availble with black fabric and black velvet only. We cannot change the velvet or add piping to these gowns. They are usually available (in stock) in regular sizes and we can also special make these for you in plus sizes. Comes with traditional mortarboard and tassel upon request, or you can order a tam to go with your gown. Prices shown above are for standard sized faculty doctor gowns. These gowns are usually available for immediate shipment. 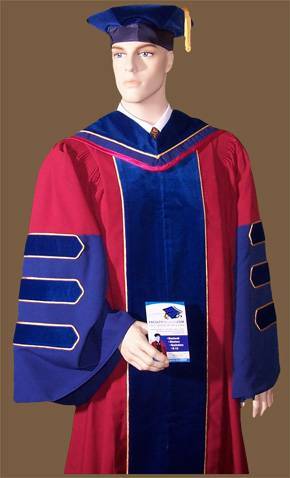 Faculty gowns would use the Deluxe hoods shown above. Don't forget your tam! Most faculty members who have doctoral degrees purchase tams to differentiate themselves from students and non-doctors. If you do not wish to purchase a tam, then we will be happy to send you a mortarboard and tassel at no charge, upon request. 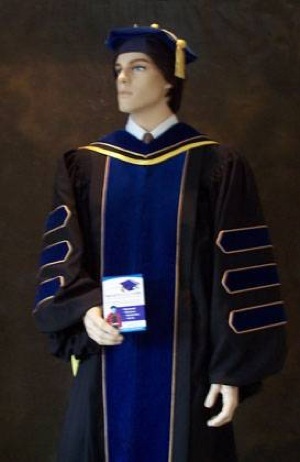 Our Souvenir Quality student - doctoral gowns are traditionally styled with velvet front velvet panels starting at the yoke of the gown, and finishing at the hem. They also feature full sleeves with three velvet stripes (chevrons) on each arm and are our most economically priced gown. We recommend the souvenir gowns for students graduating with doctorates who will not be going into academia and therefore do not need a long lasting gown. 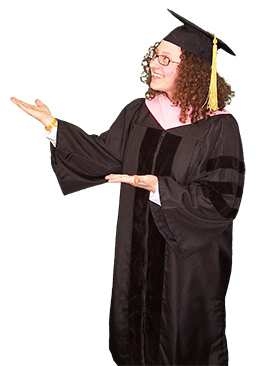 Souvenir doctoral gowns are black with black velvet are usually available for immediate shipment. Full figured (plus size) souvenir gowns are also available, and usually ready for immediate shipment. Additionally, we offer quantity discounts on these gowns. 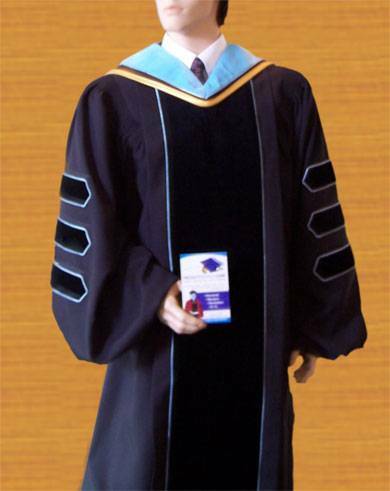 Few faculty members choose Souvenir Quality gowns, since they can be used only once or twice. However, many schools choose Souvenir Quality over rentals because we can sell them at below rental prices and their students will only be wearing them once. We can include a mortarboard and tassel at no charge with purchase or you can purchase a tam to go with your gown. If you fit in any of these categories, please be sure to indicate your weight together with your height, and to mention in your order that you require a plus (full figure) gown.